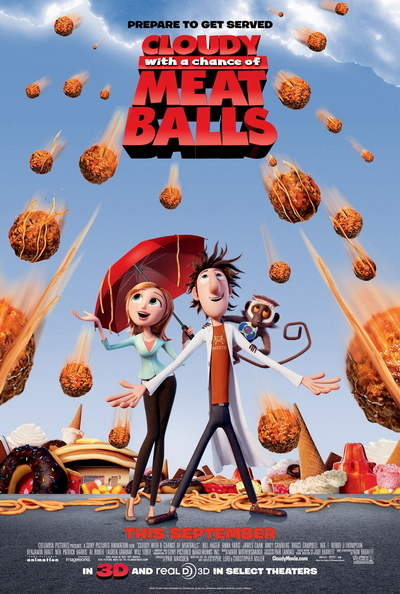 Story: "Cloudy with a Chance of Meatballs" is inspired by the beloved children's book. Flint Lockwood is a young inventor who dreams of creating something that will improve everyone's life. He seeks a solution to world hunger but gets more than he bargained for. Sam Sparks is a weathergirl covering the phenomenon who hides her intelligence behind a perky exterior. Tim Lockwood, Flint's technophobic father, struggles to continue his sardine fishing business in spite of a downturn in the market. Brent is the town bully who has plagued Flint since childhood when he was the symbol of the town's dependence on sardines. Mayor Shelbourne figures out that Flint's invention can put the town, and more importantly himself, on the map.